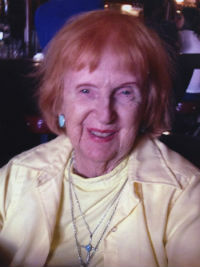 Patricia E. McNamara passed away on June 23, 2015 at her home in Santa Barbara. Pat was born in Beemer, Nebraska on December 10, 1926. She was a much loved Business Teacher at Santa Barbara High School for 21 years. After retirement she decided to take an Adult Ed class in watercolor painting and discovered her passion. Currently she has a showing of three of her paintings at the Santa Barbara Public Library. Pat is survived by her sister, Mrs. Kathyrn Von Seggern and three nephews,David,Patrick and Jim. Services will be held at Our Lady of Sorrows with the Rosary at 9:45 am right before 10:00 am Mass on Thursday,July 16th. There will be a gathering in the church hall right after services. Family and friends are encouraged to attend and share their memories and photos. In lieu of flowers,send donations to the charity of your choice.